One of the nation’s top combo guards continues to hear from Indiana. 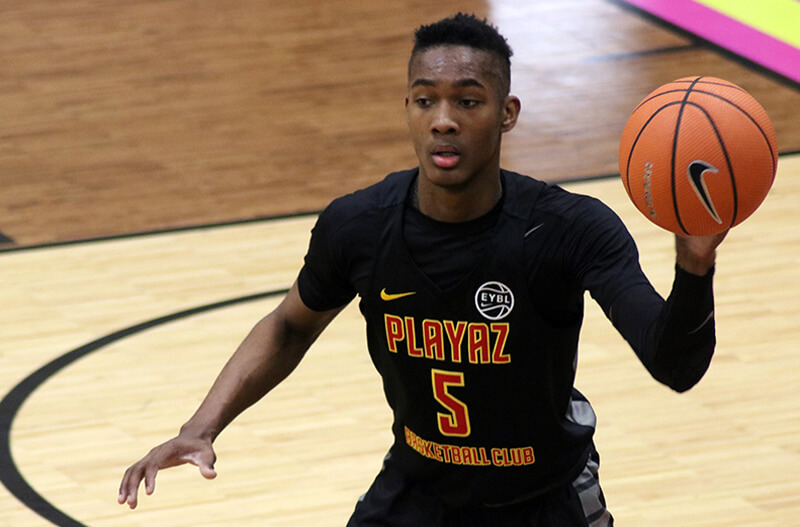 Jalen Carey, who plays at Immaculate Conception in New York and for the NJ Playaz on the Nike Elite Youth Basketball League (EYBL) circuit, was one of the country’s fastest rising players this spring. Carey, a 6-foot-3 guard, added offers from IU, Kansas, Syracuse and several others due to his strong play in the two April evaluation periods. After wrapping up EYBL last week, Carey is playing this week at the Oladipo Skills Academy at DeMatha High School in Hyattsville, Maryland. It’s the latest stop on what’s been a busy spring and summer for Carey, who also played in the prestigious NBPA Top 100 Camp last month at the University of Virginia. The next step in the recruiting process for Carey will be setting up visits next month and into the fall. Carey told Inside the Hall that he plans to begin those trips in late August. According to Carey, Indiana has remained in contact since extending a scholarship offer on April 24. The talented combo guard said he wants to make a decision before his high school season and he’s already got a good idea of what he’ll be looking for when it comes time to make a decision. In addition to IU, Carey mentioned Syracuse, UConn, Miami, Kansas, Seton Hall and Rutgers as the schools coming hardest in his recruitment. Carey said he definitely wants to visit Kansas and “probably” Indiana. The Indiana recruiting pitch appears to be focused on Carey fitting into the new staff’s style of play. VO seems to be such an ambassador for our program which can’t hurt our chances. Maybe its just me, but this kid has UCONN written all over him. UCONN has been known for having one really good guard thats a scorer who often leads them deep into the tournament. Wouldn’t be surprised if he goes there folks. I’m thinking we land Phinisee. The pitch to be the next Yogi sounds really nice for a 6’1 in-state kid. I also think we land a relatively unknown shooter and that completes our next class. You are absolutely right, that is a definite plus. I saw a little more video on Damezi Anderson and he may turn out to be the shooter you’re talking about. I didn’t view him that way initially but that seems to be the direction he’s developing. I think what took me off into another viewpoint was that he’s athletic and defends. My knee jerk stereotype of a “shooter” is a diva that’s focused on his hair and stats, Damezi is more well rounded. REALLY looking forward to this season. Trying to visualize what changes we’ll see in the returning players and how the defense will look. Also, thinking it would be a good time to get on the Forum. Interesting to see what everyone’s take is on it. I’m good with Carey, but personally, I don’t think he’s our top option in PG. What’s the odds missing out both Garland and Phinisee? Victor Olapido..O.G..Hartman…unknown recruits aren’t always a bad thing. I also want Phinisee and either one Romeo Langford or Lorenzo Dort I know we cannot get both. That would be an awesome recruiting class. 0 to 100. These are 18 year old kids. Who is the unknown recruit to which you refer?? Jalen Carey is a 4 star recruit with the likes of Indiana and Kansas and Syracuse after him. I think he is hardly an unknown! I want Phinisee and Dort! Then hold 1 scholarship for either Langford or Garland (or another top 25 kid). I completely missed that. That is a great point. Is there room 3 more scolly’s? Yes three more scolly’s because Race is 2017. I like Outoftheloop comment above, but would take either Carey or Phinisee with Dort, then leave one for Langford or Garland. There must be a lot of thinking going on about IU next point guard amongst recruits. Gracias… Not sure who I’m thinking of I am hoping it’s not the Ball brothers. Just another man’s opinion. I believe Romeo is bound for Louisville. I would love to see him wear the Cream and Crimson, but mom and dad are card fans and it’s very close to home. I hope I’m wrong but it is what it is. Romeo has stated education is an important issue and a degree from IU trumps anything U of L can offer. I like Phinisee to lead IU for several years at the point. Then Dort seems to be leaning toward IU as a combo guard. He’s another who will stay awhile. If any scholarships go unfilled then Archie will have extra to go after a couple bigs is 2019. The 2018 class is thin on great centers so we can go with DD and develop our other talents. I would much rather hold a scholarship than give it to another project that doesn’t pan out. I get your point. But when Hartman committed he was hardly an unknown. And you can’t blame OG for his injury. I viewed it in the discussion that I saw and it was not mentioned. However, I am sure it was not worth my time. Agree, I would really like to see Phinisee and Dort.. ten just hope to also land Langford.